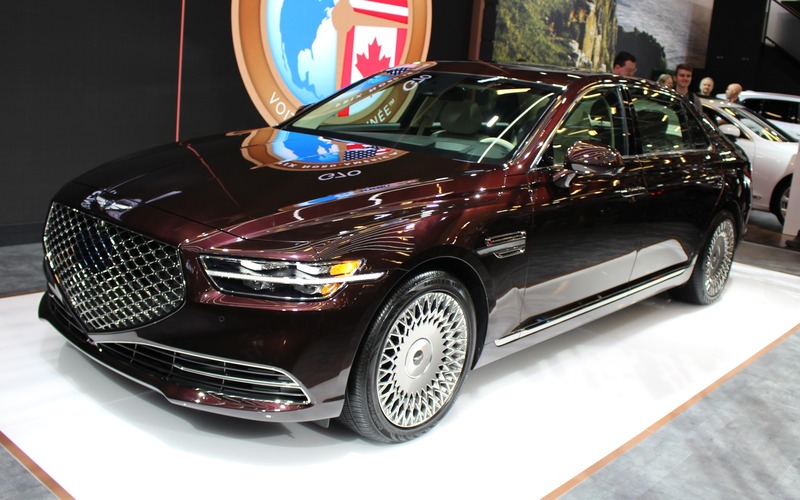 Initially unveiled in Korea last November, it’s in Montreal that the 2020 Genesis G90 will be presented as a North-American premiere at the auto show. As it’s a mid-cycle refresh, changed are mainly limited to cosmetic tweaks compared to the current version. In addition to reworking the headlights, Genesis gave its G90 a new grille that was seemingly enlarged without restraint. On the front fenders, we notice that decorative trim has been added, which stretches down the headlights. Instead of simply displaying the brand’s logo, we find the letters “G E N E S I S” on the trunklid. At the rear, the taillights have also been reshaped and occupy the full width of the car—which were previously installed at each corner. This large luxury sedan also benefits from new 19-inch alloy wheels. Mechanically, nothing has changed. The Korean brand’s flagship is still equipped with a twin-turbo, 3.3-litre V6 or a naturally aspirated, 5.0-litre V8. They respectively develop 365 and 420 horsepower in the current version of the G90. As for the cockpit, the untrained eye likely won’t notice the changes. Thanks to a noise cancellation system, front passengers will travel in utter quietness. At the centre of the dashboard lies a 12.3-inch touchscreen linked to the infotainment system, which integrates Apple CarPlay and Android Auto. Silver and Red paint colours are also new for 2020, in addition to the ones already offered.